Let me start out my saying two things. First, I was so blessed enough to receive this ARC, right before Christmas. And let me tell you, I was so thrilled and excited. I bow down to the book gods, wherever they are. I’ll even buy them chocolate. I mean seriously, do you realize how hard it is to read a good book and not be able to talk about it for MONTHS????? I’m so glad it comes out next Tuesday. I knew this book was about musicians and writing songs, but this was about way more. It was about feeling the music. Music reaches down into a person and touches their soul and it changes them. I was so drawn into the feelings of this, that I had to remind myself to breath, many times. The most exciting part of this book, is the music that went along with it. I LOVED the music!!! Griffin Peterson, who is actually on the cover of Losing Hope, has written an entire album to go with this book. At certain parts of the book, you use your phone to scan the QR code, or click on the link in the ebook, and it will take you to the song, so you can listen as you read. I’ve read it three times, with the music, and I can’t imagine reading it any other way. The emotions that went through me, while the music was playing, was just…..WOW. Now when I’m driving and I hear the beginnings of Griffin’s songs, I start to get teary eyed, because I know what scene they go too. Usually when I see song lyrics, in books, I never know the rhythm they were singing too, but this combination was perfect. I have never experienced a book like this. I know I say I’m overwhelmed in lots of books, but music is in my blood, so books with music touch me on a level that I can’t explain. Overwhelmed doesn’t even begin to explain what I was feeling. Again, it was a long three months of not being able to rave and talk about the songs. I’m so glad the album is available to everyone now. But enough about me and my crazy crying eyes, let’s talk about the story…. 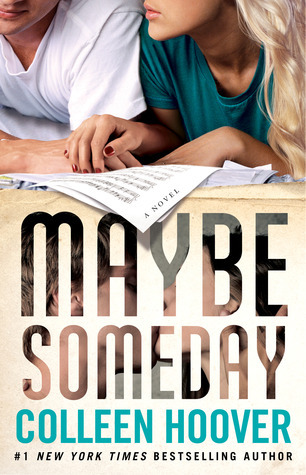 Sydney Blake finds herself captivated by her neighbor, Ridge Lawson, and his musical talent. As a music major, she feels connected to him, as he plays his guitar across the courtyard. When she finds out that her boyfriend is cheating on her, with her roommate, she is suddenly homeless, and has no idea what to do. That’s when Ridge steps in and helps her out. Ridge has been in a dry spell, writing wise, for quite sometime. But when he finds his muse in Sydney, he isn’t prepared for what happens next. The more he tries to stop it, the faster it happens. I will admit, about 1/4 of the way through, I wasn’t sure how this was going to go. I won’t say why, but something wasn’t settling right with me. But as I kept reading, I realized I was WAY off, in my assumptions. Clear as mud, I know. But trust me, just read the whole book and you’ll understand. When Ridge and Sydney write music, you feel the music. But soon they start to connect on a level they never expected. They have so many feelings that they can’t say out loud, so they say it in the words of their songs. As I read the beautiful words they created, I died. Every.single.time. The scene, where he first feels her sing, whew!!! That was a powerful scene. My stomach was in a million knots!! I was sitting at the edge of the couch and feeling everything they felt. I was so emotionally involved in their story, I could barely hold myself together. And when you add the music, in the scenes, I couldn’t see through my tears. The closer he moved and the longer we stared at each other, the more my body was consumed by need. It wasn’t a basic need, like a need for water when I’m thirty or a need for food when I’m hungry. It was an insatiable need for relief. Relief from the want and desire that has been pent up for so long. Thankfully, there were a few hilarious scenes that had me cracking up and startling those around me. Ridge’s friend, Warren, was the comic relief in this emotional story. I just loved him and his pranks. I totally wasn’t expecting those parts. He was a riot!! This book was quite hard to review without giving away any spoilers. But I will say, a few of the scenes had me stunned silent, and I’m never silent. I felt like I was sucker punched, a couple of times also. And some of the scenes I had to step back and collect myself. I almost needed my happy pills, in those ones. The connection between Sydney and Ridge was almost instant and no one could stop it from happening. By the time I finished this, I was emotionally drained and mentally satisfied. Another perfect book to add to my shelf. Well done, Ms. Hoover. Well done. A perfect book. A perfect album. The most perfect reading experience.